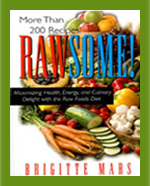 Are you looking for a raw food cookbook to add to your assortment of raw food books? I don't know about you, but cookbooks give me inspiration to stay on track when I'm on a raw food diet plan. Whether it is just to get ideas or to follow an exact recipe, they can be a nice way to get motivated and take charge of your health. Just because a raw superfood diet is "the highest, healthiest food you could possible eat", doesn't mean that it has to taste bad. Raw food and superfood meals are not only nutritious, but are packed with the real, natural flavors we were meant to taste and delight in! Although we offer an array of various raw vegan recipes to cooked recipes here on this site, we encourage the use of living food cook books to help you achieve success with all your culinary endeavors. We give our personal favorites on this page, but there are many more out there to choose from. Below are some helpful hints to choosing the right one for your specific needs and interests. 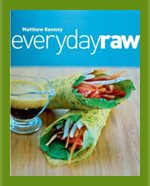 There are many great recipe books these days offering a new look at everything from the high raw food lifestyle to the gourmet raw vegan diet. You can find it all, on just about every subject, with specific raw food cookbooks on cacao, smoothies, raw crackers, nut ice creams, etc. Many raw, superfood recipe books are divided up, like any other cookbook, with drinks, main entrees, desserts, breakfast foods, and the like. Most tend to have recipes with "themes" like Mexican, Italian or Thai food. These creations use the spices and flavors innate to these cultural cooking traditions. The only difference is that they are raw, alive and energizing to the body. A raw cook book can be just the thing you need to inspire "food art" in your kitchen. Sometimes, I just love to flip through the pages and look at all the colorful pictures and raw creations to get ideas. I guess you could say a raw cookbook is not really a "cookbook", but a "un-cookbook", teaching you to prepare foods without the use of a stove, oven, crock pot and, especially not, a microwave. These recipes use kitchen tools like a dehydrator, a high speed blender, a food processor and other common kitchen gadgets. All of these basic appliances will come to life in new ways in your raw kitchen, so you'll want to pull them down from the top shelf of your pantry. 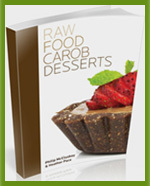 What Kind Of Raw Food Cookbook? 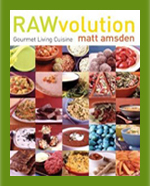 So, if you are in the pre-planning stage, looking for the best possible raw food cookbook for your needs, there are a few things you might want to consider. Mainly, the type of raw recipe book you want to buy. Below we break it down into the basic categories. 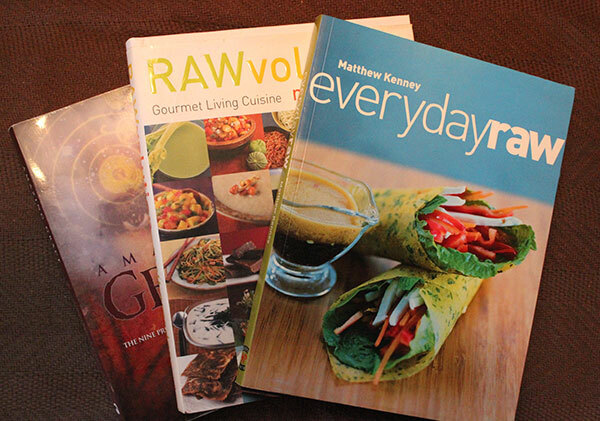 1) Gourmet Raw Vegan Cookbooks - these usually include recipes for the raw-chef who really wants to go for it. They may involve some prep time but in the end you will have a gourmet raw dish, for people who like to create works of art in the kitchen. 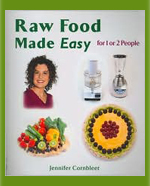 2) Simple Raw Recipes - these raw books entail healthy recipes that are easy to make for the beginning raw chef student or anyone who likes to keep things simple in the kitchen. They are great if you are short on time, with the focus being to offer basic meals that are delish, yet are a healthy "fast food". 3) Specific Recipe Subject - These non-cook books are "subject specific" with recipes on a precise category like desserts, crackers, soups, ice creams, etc. 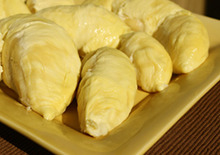 Some include recipes based around a particular superfood. They range between easy to more complex ingredients and prep times. This selection of raw cookbooks have been put to the test many times by my husband and I, with green soup and nut pate' stained pages, they have stood the test of time in our raw recipe book collection. Enjoy them yourself or discover many others out there. The raw food diet is becoming more popular with the modern age, as vibrant health has become top priority for many people, young and old. Many times you can find books at health food stores. This gives you the opportunity to browse through specific raw food cookbook recipe styles and pics to find what you like.